There’s something to be said for sense of place, particularly when it comes to food. Setting the scene is often half the battle for restaurateurs, one that Alberto and Christine Gonzalez have won with their cigar-box-sized Cuban carryout spot. 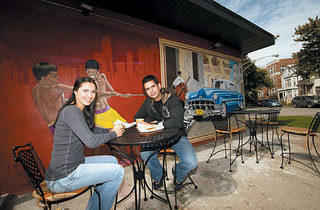 Alberto, who emigrated from Cuba to Miami in 1980, is behind most of the menu, but the couple collaborated on the decor, plastering the walls with Cuban newspapers, hanging photos of Cuban celebrities and commissioning the brightly painted mural that wraps around the squat, stand-alone building off dusty Clybourn Avenue. Orders are taken at the counter, where a warmer case sits, packed with flaky guava pastries (which are shipped frozen from a bakery in Miami and then baked up daily). It’s a familiar setting for anyone who’s been to Miami’s Little Havana, expat central, which sits “90 miles” from Cuba. Mornings bring a slow-moving stream of blue-collar guys looking for the jolt of Cuba’s famed cafe con leche, sweetened espresso with warm milk. To get a better taste of the excellent espresso, opt for a cortadito, which gets only a dollop of frothed milk. Grab one of those guava-cream-cheese pastelitos while you’re at it and you’ll be amped through morning well into lunch. Midday sees traffic from nearby workers sick of brown bagging, who get relief with the meaty Cuban sandwich or the Guajrito, essentially a Puerto Rican jibarito that piles marinated nickle-thin steak, grilled onions and cheese onto crispy green plantains instead of bread. Dinner brings the heft, with generous portions of rib-sticking classics like lechon asado (hunks of pork roast that tend to be a bit salty but are juicy nonetheless) and ropa vieja (tender shredded beef in a rusty-red pool of tomato and bell-pepper juice). The white rice alongside is nice and fluffy, the sweet plantains appropriately greasy and the inky black beans characteristically one-note, with only a few flecks of white onion to flavor them. Nothing is modernized, fused or even aggressively flavored—it wouldn’t be Cuban if it was. Great food, service and the owners are warm and friendly. They want the best for their customers and are always bringing in new ideas to make your time at 90 Miles enjoyable and filled with fun memories. Love love love their food. I actually really like this place! Great outdoor patio. Entertainment all of the time...music & dancing. The service is usually pretty good. BYOB! And they'll even do sangria if you bring the wine. The food was really good the last time I went. Chorizo & goat cheese empanadas are a must. So good. The calamari is different but delicious. It's squid ink and looks very unappetizing, but it had great garlic flavor and TONS of calamari We had the main entree from DDD. It's good! Overall I think it's a great place to go, eat & watch. 90 Miles Cuban Café is lively, fun, delicious and surprisingly veg friendly! The dishes here are seriously mouthwatering - my favorite is the vegetable and tofu entree served in a simmering tomato and pepper sauce. A meal here wouldn't be complete without some arroz y frijoles and sweet plantains on the side! The patio is smaller than their armitage location, but the food is just as delicious and a trip here feels like a little vacation.